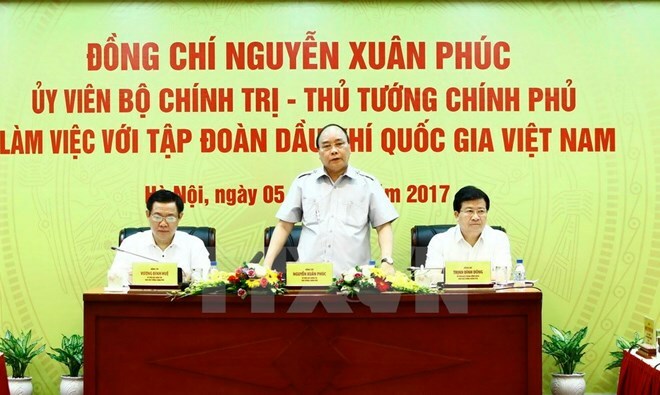 Hanoi (VNA) – The Vietnam National Oil and Gas Group (PetroVietnam) produced 9.23 million tonnes of oil in the first seven months of 2017, the group reported to Prime Minister Nguyen Xuan Phuc in Hanoi on August 5. The group’s total revenue in January-July reached 278.5 trillion VND (12.25 billion USD), surpassing the seven-month target by 14 percent and fulfilling 64 percent of the yearly goal. PetroVietnam actively implemented science-technology and training activities as well as ensured oil and gas security and safety, environmental and labour safety. The prevention of fire at oil and gas facilities was seriously controlled while social welfares were carried out. The group strives to produce at least 13.28 million tonnes of crude oil and 10.61 billion cubic meters of gas in 2017 and keep a close watch on oil prices to promptly cope with any fluctuations. It will also focus on safe and stable operation of oil and gas plants in addition to speeding up investment and prioritising capital for projects completed in 2017. At the working session, Prime Minister Nguyen Xuan Phuc recognised the group’s contributions to affirming national sovereignty and increasing the State budget.